Additional events Vermont Mutual is proud to participate in include the American Cancer Society’s Relay for Life and Freezing Fun for Families. These events are important to our communities and our employees. Relay for Life is a Relay “Race” which runs all day and all night. Teams work together walking in stages around the track to raise money for cancer research and volunteers from Vermont Mutual are proud to participate. 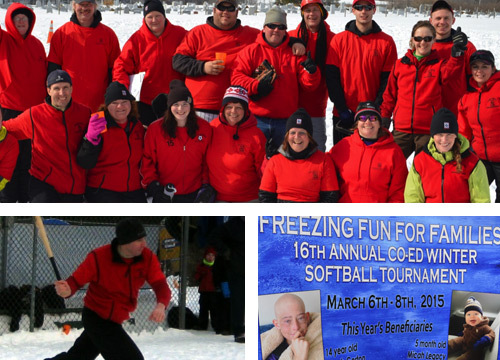 Freezing Fun for Families is a local tournament that takes each year in early Spring while the ground is still covered in snow. Freezing Fun For Families aim is to make the lives of families battling cancer a little bit easier by raising funds to help with the financial burdens brought about through treatment. Vermont Mutual volunteers are grateful for the opportunity to join in, have some fun and so a lot of good.